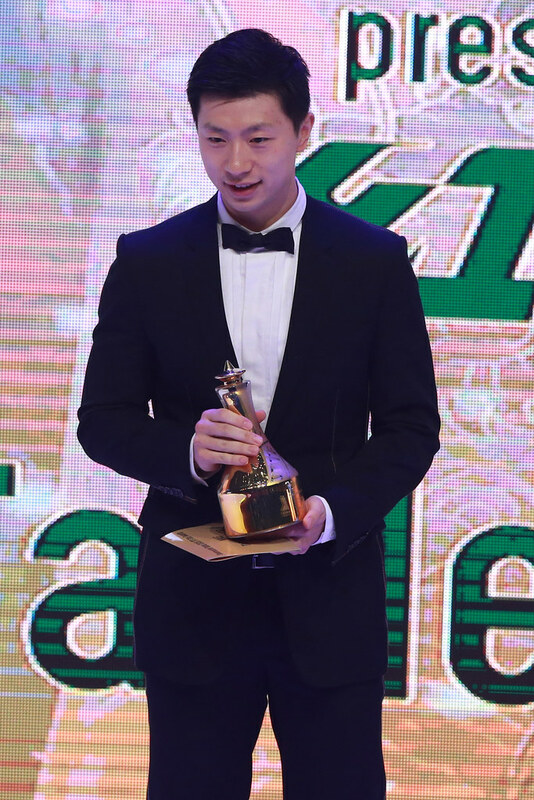 The reigning Olympic and World champions, China’s Ma Long and Ding Ning were both honoured at the spectacular 2016 ITTF Star Awards Gala Dinner staged at the Sheraton Hotel in Doha on Thursday 8th December. Presented by Double Happiness, Ma Long won the Male Star Player Award; provided by Nittaku, Ding Ning secured the Female Star Player Award. It was the second time the each has claimed the prestigious award, received at an occasion that witnesses ever growing standards. The event is now a highly professional show. An evening which combined awards with video replays of the most memorable moments of the year, met with the universal approval of all concerned; it was a fact Thomas Weikert, ITTF President, duly acknowledged. The Qatar Table Tennis Association led by Khalil Al-Mohannadi proved first class hosts, having co-operated in particular with Singapore based office of the International Table Tennis Federation to realise an event that will live long in the memory. Major awards for China and there were more. Presented by Butterfly, Liu Guoliang, the Men’s National Team Head Coach, received the Coach of the Year Award for the second time in succession, whilst offered by Stag International, Liu Jing was named Para Female Athlete of the Year. Notably at the Rio 2016 Olympic Games, she won gold in Women’s Singles Class 1-2 and in Women’s Team Class 1-3. Also, for his amazing so-called roller shot when retrieving the ball from below the height of the table at the ITTF World Tour Laox Japan Open, Fan Zhendong received the accolade for the point of the year. “I am grateful for the recognition and the honour, I will continue to work hard to become a better player”, Fan Zhendong. Awards for China and there was more recognition. Xu Xin, Ding Ning and Liu Shiwen were all inducted into the Hall of fame; they had all met the requisite of securing five gold medals during their careers at World Championships. Acclamation as in previous years for China but there were firsts, there was a first for Belgium and for Egypt. Presented by Tinsue, Laurens Devos won the Male Para Star of the Year Award. Ice cool under pressure, at the Rio 2016 Paralympic Games he secured the Men’s Singles Class 9 title. At 16 years of age, he became the youngest player ever to win gold in a table tennis event at a Paralympic Games. Meanwhile, Egypt’s 15 year old Rinad Fathy received the Fair Play Award for advising the ball had touched her side of the table in the Girls’ Team final at the ITTF-African Junior and Cadet Championships when facing Tunisia. The officials had deemed otherwise. A well merited award for Rinad Fathy, it was the same for Japan’s 16 year old Miu Hirano; presented by Frank Gee from the Monday Club, she received the Breakthrough Player of the Year Award. Winners but all were winners, commemorative plaques were presented by Thomas Weikert to the sponsors; a memorable night was enjoyed, a credit to all concerned.